The relationship between intellectual property (IP) andinvestment is old, but the debates are new. Recent high profile cases in which intellectual property rights (IPRs) are being sought to be protected by means of international investment law and treaties have generated visible debate and discussion. 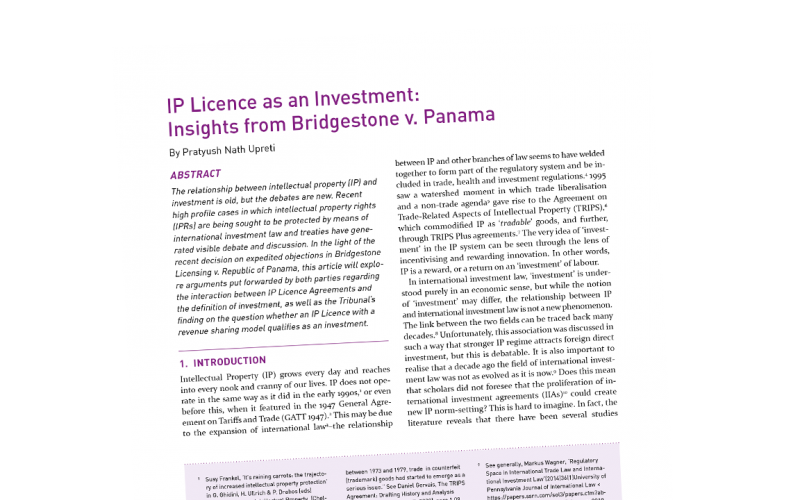 In the light of the recent decision on expedited objections in BridgestoneLicensing v. Republic of Panama, this article will explore arguments put forwarded by both parties regardingthe interaction between IP Licence Agreements andthe definition of investment, as well as the Tribunal’sfinding on the question whether an IP Licence with arevenue sharing model qualifies as an investment.